John Constantine may have escaped The Spectre's wrath but two allies have paid the price for his freedom. First The Ragman fell and now Boston Brand - the ghostly acrobat known as Deadman - is about to die his final death. As Brand races the clock to appoint a successor to his position as an agent of balance, John Constantine must face the one being he dreaded seeking aid from most... The Swamp Thing! What makes this issue so wonderful - and indeed this series so amazing - is Tom Taylor's command of the characters. This goes beyond well-written situations and funny dialogue - Taylor truly understands the essence of each character and finds unique ways of playing them off one another. For instance, Pairing John Constantine and Batman seems like an odd coupling until you realize they are both pragmatic strategists who have both invested a lot of time and effort into thinking on how to take down their more powerful colleagues. Likewise, Taylor gives us a successor to the Deadman mantle who proves so natural a fit that it's a wonder no other writer has run with that same idea before. 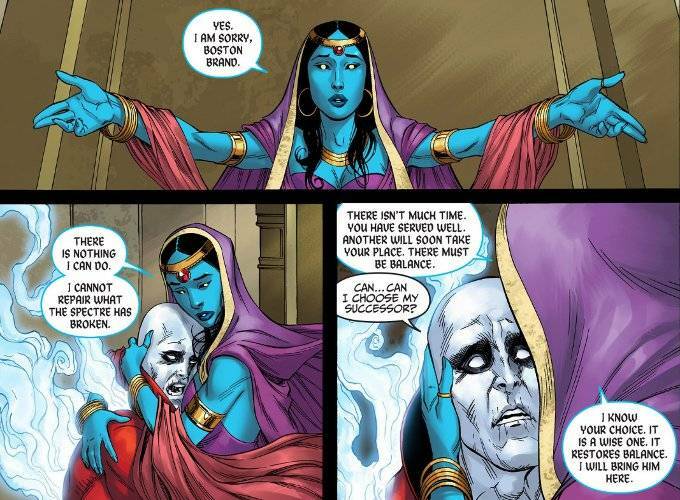 Per usual, the art by Mike S. Miller and J. Nanjan is wonderful. Miller's figures are expressive and Nanjan shades the artwork without overemphasizing certain elements. or obscuring the details in shadow. 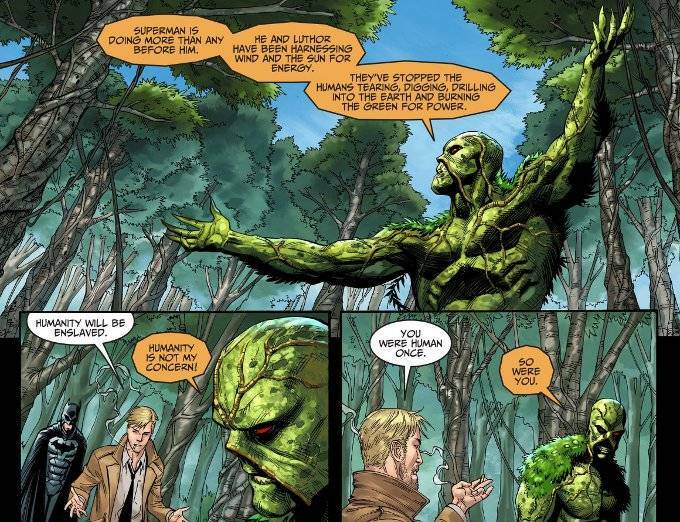 This is of particular concern in the sequences with Swamp Thing, which manages to maintain a certain vibrant level of energy despite its dismal setting.